With Kris Bryant brazenly fortifying the cover of 2017 Topps Baseball, Topps is making a clear signal of their expectations for their flagship product. Promoting this year’s theme of having fans, “rediscover Topps baseball,” the quality of this set is exhibit A as to why 2017 is a perfect time to fall in love with baseball card collecting. The 350-card base set, book-ended by Bryant and David Ortiz, features action-packed photos of key players across the league. Sharp collectors will notice that Topps reinserted card number seven back into the checklist, placing New York Yankees phenom Gary Sanchez in the spot previously skipped or reserved for Mickey Mantle since 1996. No matter how impressive the clear and crisp layout of the base set appears, 2017 Topps Baseball's true gem is the 1987 Topps 30th anniversary parallels. Designed in the wood motif of the most fashioned set of the 1980s, the glossy updated look and feel of the 30th anniversary parallels are sure to attract collectors for both nostalgic and aesthetic reasons. Some collectors would go as far to argue that Topps could have made the entire base set a throwback to the 1987 design. 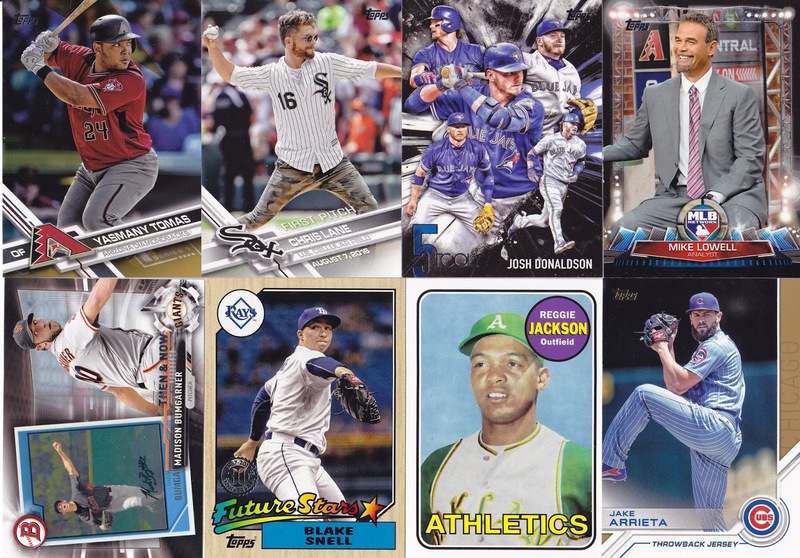 Topps keeps tradition by creating a wide array of inserts and parallels to keep collectors interested past compiling the base set. 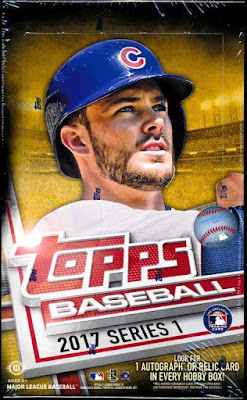 The expansive Topps Salute 100-card insert set presents a beautiful chronology of the past season, and the Five Tool subset highlights the ultra-talented superstars that excel in many facets of the game. Each box promises one autograph or relic card. The box provided for this review uncovered an autographed Jose Canseco 1987 Topps 30th anniversary card. Canseco’s original 1987 Topps card was one of the most iconic in the set, the card emblazoned with a Topps Rookie Cup picturing the young slugger eagerly sitting in the dugout. The 30th anniversary autographed version featured a Canseco orbiting a trademark moon shot with a bold signature on the card. Set builders will be happy with the collation, as a box came up only 30 cards short of a 350-card complete set; however, the cards were condition sensitive, as quite a few had dinged corners fresh out of the pack. 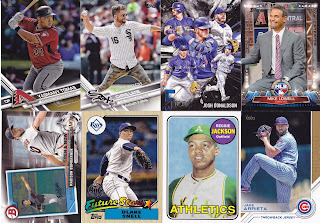 Buoyed by the stunning 1987 retro cards, collectors will easily overlook a few soft corners as they are quickly reminded why Topps remains the industry gold standard.